Looking for information about the Hang? 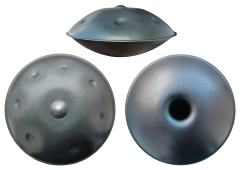 The Hang® is a musical instrument invented and built by PANArt Hang Manufacturing Ltd. in Bern, Switzerland. Hang is the right article for all those who don't have the foggiest notion. Sound sculpture Hang provides the up to date information about the Hang on PANArt's website. The Hang Booklet 2008, the Letter from the Hangbauhaus November 2009 and The call of iron (2011) afford information directly from the makers Felix Rohner and Sabina Schärer. The documentary film "HANG - a discreet revolution" describes the early years of the Hang. Hang player Matt Venuti answers some of the frequent questions that people ask him about the Hang in The Hang Instrument. You can look up single key words and get definitions and information in the Hang Lexicon. Information about purchasing a Hang provides a summary about the distribution of the Hang from the beginnings to the Free Integral Hang. In 2014 PANArt stopped building the Hang. The Hang Guide by Felix Rohner and Sabina Schärer is addressed especially to Hang players. The Hang Library provides comprehensive access to all relevant publications about the Hang. Want to be considered a Hang Aficionado? Then you know the real name of this sound sculpture: Hang. Unfortunately you often come across the term hang drum on the Internet, a name that has spread especially on YouTube and Facebook. Calling it a hang drum frequently gives rise to misunderstandings about the characteristics and way of playing of the Hang. Read more about this topic in What is a hang drum? By the way: If you wonder why this website is called hanghang.info, you will find the answer here.